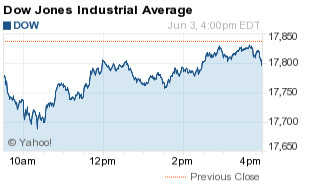 The Dow Jones Industrial Average today (Friday, June 3) fell 31 points on the heels of a disappointing May jobs report. The numbers indicated the rose-colored glasses worn by Fed officials in recent weeks aren't reflecting the true state of the U.S. economy. After several rounds of speeches by Fed officials in which they touted economic growth, job market resiliency, and projected multiple rate hikes by December, the dismal employment report likely spoiled their summertime monetary plans. Here's everything you need to know about the markets on June 3, 2016. First up, the good news was the official U.S. unemployment rate fell to 4.7% in May. The bad news: The U.S. economy created just 38,000 jobs, falling well short of economist expectations. Forecasts called for 158,000 new jobs. Economists argued the numbers were likely going to be held down due to the massive strike by workers at Verizon Communications Inc. (NYSE: VZ). However, this big of a miss is hard to blame on just one factor. The weak jobs report sent gold prices today soaring more than 2.5%, as investors don't expect the U.S. Federal Reserve to raise interest rates in the coming weeks. The weak jobs report reduced the odds of an interest rate hike in June from 21% to just 4% after the announcement, according to CME FedWatch. The more important figure is the expectation of a rate hike in July. That figure fell to 34%, just days after it was becoming a foregone conclusion that the central bank would take action in the early summer. In deal news, shares of Latin American airline company Avianca Holdings SA (NYSE ADR: AVH) surged 25.7% today on news the firm is considering a deal to sell itself in the coming weeks. The Wall Street Journal cited two possible suitors: Delta Air Lines Inc. (NYSE: DAL) and United Continental Holdings Inc. (NYSE: UAL). DAL stock and UAL stock were off 2.1% and 1.9%, respectively. The weak jobs report also took its toll on crude oil prices as lackluster job growth renewed concerns about the resilience of the U.S. economy. WTI crude prices fell 1.1% to $48.62 after Baker Hughes Inc. (NYSE: BHI) reported an increase in the domestic rig count. The recent rebound in oil prices from February lows fueled an increase of nine rigs last week. This is only the second time that weekly rig data came back showing an increase. Brent crude was down just 0.8% to $49.64, despite yesterday's failure by OPEC to reach an accord on oil production. That's because crude has faced supply disruptions across nations like Nigeria, Venezuela, Libya, and Canada. The worst problems are taking place today in Nigeria, where militants continue to attack the nation's oil infrastructure with promises to cripple the nation's energy supply. On the earnings front, shares of Broadcom Ltd. (Nasdaq: AVGO) were up 4.9% after the semiconductor manufacturer topped earnings expectations. The firm reported earnings per share (EPS) of $2.53, beating forecasts by $0.15. The company also announced plans to hike its dividend as optimism grows for its revenue streams tied to wireless devices. The problems continue to mount for Twitter Inc. (NYSE: TWTR). The company now has fewer users than Snapchat, according to Bloomberg. That wasn't the only big news for the micro-blogging site. This morning, The New York Post reported Twitter executives met with Marissa Mayer, the CEO of Yahoo! Inc. (Nasdaq: YHOO), to discuss a potential merger. TWTR stock was up 0.1% on the day, while YHOO stock was off 1.5%. Coffee and beer are together at last… but not in the way you're thinking. Reports indicate Starbucks Corp. (Nasdaq: SBUX) is partnering with Anheuser-Busch InBev SA (NYSE ADR: BUD) to break into the ready-to-drink tea market. Shares of Toyota Motor Corp. (NYSE ADR: TM) were off marginally after the automaker said it had to stop production at three plants after a recent explosion at one of its facilities. The firm will resume production next week. Finally, here is your stock of the day. On Friday, the weak U.S. jobs report sent gold prices up more than 2.5% — but there's another underappreciated commodity that had a massive day. In fact, this commercial metal has 30% upside given its forecast for a closing price in 2016. But you'll never know what it is, unless you click here.